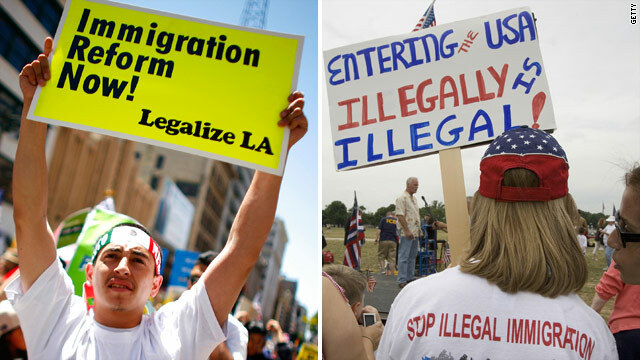 (CNN) - Reactions flowed in Friday to the White House announcement that it will stop deporting young illegal immigrants who were brought to the United States as children if they meet certain requirements. See the full list of statements after the jump. "This is amnesty. It ignores the law and invites more people to come here illegally, while we still haven't secured the border or fixed our inefficient legal immigration system. We are a nation that has and will always welcome immigrants with open arms, but it must be done legally instead of creating new incentives to break the law. We have debated this same type of amnesty numerous times in the last decade, and each time the American people rejected it and demanded border security and a better legal immigration system. The President’s actions trample on the rule of law and remind voters of why he should be defeated in November." “With its action today, the Obama Administration is making a significant portion of the DREAM Act a reality. Ending deportations of innocent young people who have the potential to drive tomorrow’s economy is long overdue, as are many common-sense reforms needed to center our immigration policy around our economic needs. We have a system that is choking our economic growth by chasing away the entrepreneurs who can create jobs and the talented people businesses need to succeed and grow. Smart immigration policy protects our borders while ensuring America remains the destination for all those willing to work hard and dream big." "It reflects the nation's priorities. Many of these people were brought to this country as infants. The vast majority of them have lived here their entire life. These young people know no other country and often times can't speak the language of their parents and or whatever country they came from. This is the right thing to do. I applaud the president for doing it, and I think it's going to mean a great deal to the many families who live in terror that their kids may get deported through no fault of their own." Immigrants are a driving force in cultural and economic life in cities throughout our nation and a vital part of our country’s history and future. Here in Chicago, whether in Rogers Park or Little Village, our city’s vitality has been built on the strength of immigrant populations that have come to enjoy new freedoms and access new opportunities. I applaud President Obama for making strides that will not only help the City of Chicago grow, but will give families and students across the country a better chance of achieving the American Dream. “The President's action is an affront to the process of representative government by circumventing Congress and with a directive he may not have the authority to execute. The President once denied that he had the legal authority to do this, and Congress was assured more than once that the administration would consider individuals for this sort of deferred status on a case-by-case basis only, and that there was no plan to implement a broad-based program. It seems the President has put election-year politics above responsible policies." "Today, President Obama blatantly ignored our Constitution, the role of Congress in making laws, and the separation of powers. He showed us all that he believes he is above the Constitution and the law on healthcare, marriage, religious freedom and now immigration. President Obama's ideology, his inability to lead and build consensus, and his political self-interest guide his policies rather than the public interest. The contribution of immigrants to our country is central to our success, but so is the Constitution and the rule of law. We should honor both rather than undermining legal immigration and Constitutional principles such as separation of powers. President Obama's actions today are part of a disturbing and arrogant pattern where he believes that his administration knows better than those who we elect to represent us in Congress. And if he has the opportunity to govern for four more years, I strongly believe our country's future prosperity is at risk." It is no coincidence that this sweeping policy change which was announced less than five months before a presidential election. Most importantly, this unilateral act is a preemptive strike against the United States Supreme Court in it's decision on senate bill 1070 which may come as early as this Monday. It doesn't take a cynic to recognize this action for what it is: blatant political pandering by a president desperate to shore up his political base. As I've said many times our nation's immigration system is as broken as our border. But now is not the time to grant broad amnesty to nearly one million people and now is not the time to approve something via executive fiat which that president knows he could never get through Congress. “The Administration is overstepping its authority by weakening immigration laws without Congressional approval. I am very concerned about efforts to administratively implement amnesty for countless illegal aliens under the age of 30. It is vital that US borders are secure prior to any consideration of amnesty proposals." "In one fell swoop the President has accomplished what far too few Republicans were brave enough to even discuss. The President has done all he can and it is now up to our colleagues across the aisle to join us in finishing the job and passing the full and undiluted DREAM Act." "This is yet another example of executive branch overreach. We have a legislative process that ensures representative governance by the consent of the American people. This action should be crafted into legislation, debated in committee and brought before the House and Senate for vote, with accordance of our Constitutional Republic way. Secretary Napolitano is an unelected administrative bureaucrat who does not have the right to make governing decisions for this country. It is apparent that the goal of the Obama administration is not to govern, but rule by edict. This again is a reflection of the desperation of President Obama and his liberal progressive disciples as November draws nearer. I find it ironic that Secretary Napolitano would not assist our State of Florida with ensuring the integrity of the voting process but she can make a unilateral decision about who can reside in America." “President Obama’s decision to grant amnesty to potentially millions of illegal immigrants is a breach of faith with the American people. It also blatantly ignores the rule of law that is the foundation of our democracy. This huge policy shift has horrible consequences for unemployed Americans looking for jobs and violates President Obama’s oath to uphold the laws of this land." On behalf of the U.S. Conference of Catholic Bishops (USCCB), I welcome the announcement by President Obama today. . . This important action will provide protection from removal and work authorization for a vulnerable group of immigrants who deserve to remain in our country and contribute their talents to our communities. These youth are bright, energetic, and eager to pursue their education and reach their full potential. They did not enter our nation on their own volition, but rather came to the United States with their parents as children, something all of us would do. We call upon the President also to review Administration deportation policies and more aggressively pursue the policy of prosecutorial discretion for other populations, a policy which was announced last year. Families continue to be deported and separated, causing undue suffering. The action by the President today is no substitute for enactment of the DREAM Act in Congress. Congress needs to man up, grow a pair, or whatever is necessary to bring Obama up on charges. Even I know that doing this is illegal, but they are letting him get away with it so far. I like the idea of the work permit – reaps the entrepreneurial and tax benefits for those that want to succeed in the US. This is just wrong. It is not fair. If you are going to do this then you have to give the same benefits to everyone else in the world. Just because people who are in close proximity to the border and capable to jump that border should be given this privilege over people who live on another continent. They should come fairly just like everyone and just like my ancestors did +100 yrs ago. There are more people waiting in line longer because of these cheaters. Look, we all wish a better life for everyone but I don't think its fair. My wife is a LEGAL immigrant, and as far as I'm concerned, this is the equivalent of Barack Obama sticking his middle finger in her face, and then spitting in it. I am offended beyond words by this, and I trust that the duly elected representative government we have in this country will step up and stop him. Impeach him, if necessary. He is not allowed to behave like a king and determine the law for himself just to score some extra votes in an election year. I'm sorry to all the illegal kids in this country who may be in the situation Obama is looking to resolve for them, here, but do NOT be angry with America because you're illegal. Blame your irresponsible, law-breaking parents for puting you in this situation. No matter who you are or how you came here, you have no right to cut in line ahead of all the good law-abiding people who are following the rules and doing the right thing. You ought to be deported so that you can begin the LEGAL process of coming to this country, if that's what you want, but America is not about rewarding people who spit on our laws. Take it out on your parents for putting you in this situation, but it's wrong to expect America to be sympathetic for them bringing you here illegally. California was not Mexican territory. Majority of the western US was spanish territory. That was either won or bought through spanish american war. Mexico lost that land by the time Spain lost its sovereignty of Mexico. Technically, they never had it to begin with. Stand corrected. mexican american war. And it was bought for $18 million and US forgave mexico's debt. This going to cause more animosity toward latinos, whether they are in this country legally or not. What bothers me the most is that so many families are doubling and tripling into one home, because our own children are having such a hard time finding the jobs needed to have their own homes. And yet we are to appreciate that people who have broken our laws are given free passes to achieve their own dreams? What ever happened to respecting the laws, and the natural born citizens of this country first?? So America.... is this the "Hope & Change" you voted for in 2008? Wanton disregard for the laws of this nation. So America.... is what you thought "fundamentally change the USA" meant? And JUST when you thought the Obama, the Great Divider, couldn't possibly create any more divisions and divisiveness in this country!! All for him to get re-elected because he's failed for 4 years. The American people MUST END THIS NIGHTMARE in November before Obama totally destroys this country economically and in every other way. This is the last straw for this Democrat. I'll be voting in the upcoming election and I'll just have to hold my nose and vote for Romney. Wow, Be very careful Americans, This predisdent is nothing more that a dictator, I wonder who is really pulling the strings on this. Its also insulting that he would do this just to get votes. We the people will be here for a little while longer cause prob. 4 more years it will not stand for We the people, What next he will overturn the two term presidency like Chavez. Very scarey. I wish he loved his country first, but he wants it to be a third world country. Illegal is Illegal. Fix the problem! This is an obvious election year gambit meant to buy votes. It's a disgrace that this makes a mockery of our existing immigration laws. Yeah. And SECURE the border. And ENFORCE immigration laws. Or don't the last 2 count in your world? The borders are more secure than at any other fime in our history, especially the southern border areas. We have nearl the double the number of border agents and enforcement personell along the southern than we had under GWB. We have been turning away people at the borders for the past 2 years in record numbers, part of it is from your Stimulus money at work. All of this adds up to the fact the current laws *are* being enforced, and are being enforced at a higher level than at any other time in history. The numbers speak for themselves. Your rhetoric speaks for itself, but not the facts. What clear is Democrats for it, Repubs against it, independents either way. Do your thing Mr. President, at the heart of it all and in who it addresses, its the right thing to do!! I applaud you!!! You have to read very carefully what this is about. First of all, it is not amnesty. It is just a part of prosecutorial discretion. It just means that they will not deport them for 2 years,and in some cases they might get work authorization. Now, in order to get this they have to come in contact with, you guessed it, immigration authorities. What does that mean? If they want this, they will have to present themselves before an ICE officer and tell him he or she wants prosecutorial discretion applied in his or her case. Like I said before, this is not amnesty. No one is giving those kids a legal resident card like most immigrants get when they enter the country, much less citizenship. This is going to be done in a case by case basis,so its not for every body, They also have to pass a background check, meaning that if some of those individuals are found to have committed crimes they will be placed in deportation right away. You should read the Janet Napolitano memorandum. So, lets make it clear one more time, this is not amnesty .Amnesty means forgive and forget. We are not forgiving, we are not forgetting. Those individuals will have no pathway to citizenship, no legal status whatsoever. And the law applies to everybody ,not just a certain ethnic group if you know what I mean.